We require a 20% deposit, which is non-refundable. Upon receipt of your deposit we will confirm your booking by e-mail or post. The balance of your holiday must be paid 8 weeks prior to your holiday start date. If the balance is not received by this date we will assume you no longer want the caravan and it may be re-let. We require a £50 security deposit to be paid with your final payment. If the caravan is left clean and tidy (washing up done and put away and all rubbish removed) and no damage or breakages are found, the security deposit will be refunded within 7-14 days of your holiday. 1) All bookings are 3pm for arrival and 10am for departures. The keys are kept in a key safe & you will be given the code on the day if your arrival. 2) The occupier will be held responsible for any loss or damage of equipment during their stay. 3) Only persons named to the owner are allowed to stay in the caravan. 4) The lead person booking must be over 21. 5) No pets are permitted to stay. 6) No smoking is permitted in the caravan. 7) If any person in your party displays anti-social behaviour your whole party could be evicted from the park by Haven, with no compensation. 8) We cannot accept liability for any personal injury, loss or damage which any of your party sustain. 9) We are unable to accept liability for any disturbance due to workmen, other holiday makers or the movement of caravans around the site. 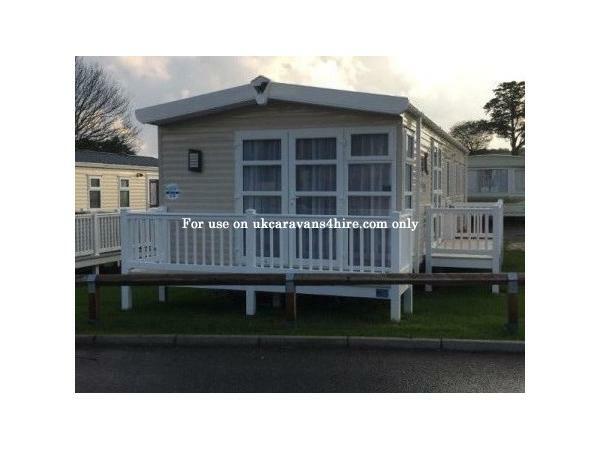 This is our luxury (platinum graded) Willerby Skyline caravan with decking to let on Weymouth Bay Holiday Park in Dorset. It has full double glazing and central heating, and is located very close to the entertainment complex and swimming pool. 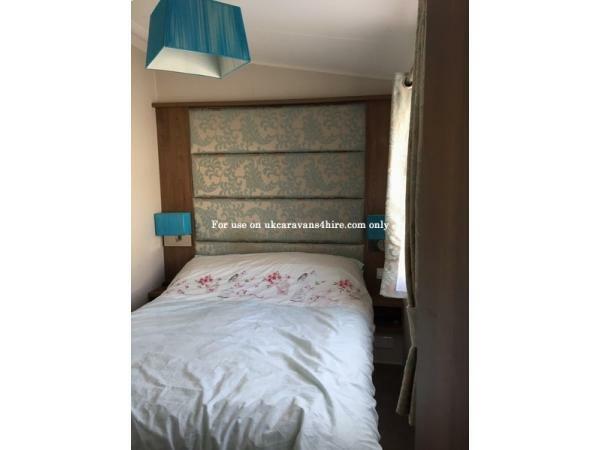 The caravan sleeps 6 and has 3 bedrooms that comprise of one double with en-suite toilet and basin, and two twin rooms. In the hallway there is a vanity area and leading off is a large shower room with toilet and basin. There is an open plan lounge, dining and kitchen area. The fully equipped kitchen has a full size fridge freezer, integral microwave and large cooker. The lounge has a 43 inch flat screen smart TV with Freeview & you can login to your Amazon or Netflix accounts, we also have WiFi which you can access at an additional charge payable to Haven. The lounge has an electric fire in addition to central heating and there is plenty of seating on the large sofa (which is also a double sofa bed). The dining table extends out so that everyone can be seated on the 4 chairs & 3 stools. From the lounge there are double French doors that open on to decking where you will find a table and chairs. 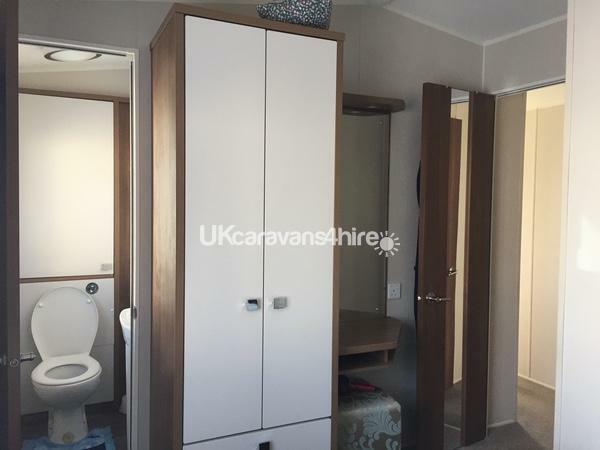 There are additional double French doors to the side of the caravan, which open on to a further decking area with a lockable side gate for added security. There is a hard standing area for one car to the side of the caravan. Quilts and pillows are provided, but not linen. This can be hired from Haven if you do not want to bring your own. Gas and electricity costs are included in the hire price. Entertainment complex passes are sold separately and are available directly from Haven reception.This will entitle you to use all the facilities of the adjoining park at Seaview as well as Weymouth Bay. Amusement Arcade, Pizza bar and restaurant, entertainment lounge, a convenience store, laundrette, tiger treasure shop, indoor and an outdoor pools with lazy river and a sun terrace, children's clubs and entertainment, playground, laundrette. Football coaching, archery, fencing, mini fencing, shooting, crazy golf, table tennis, funworks amusements & games room, family games show, pool tables. Bowleaze Cove is a short walk from the site where you will find a beach area with restaurant, arcade and children's rides. Weymouth town centre is a 15 minute bus ride away, the bus stops just outside the Park. Weymouth is a great holiday resort suitable for all ages and has an excellent sandy beach, harbour area and shops. Other places to visit include: Sandworld, Weymouth Sealife Park, Monkey World; Jurassic Coast, Corfe Castle, Portland. A lovely caravan to stay in for our week at Weymouth bay. Lovely lay out of the caravan and 2 minutes walk to the entertainment complex. Owners of the caravan very friendly and communication was brilliant all through the booking experience of the caravan right up to the day we went on holiday couldn't of had better. Looking to book this caravan next year for our holiday.